As they say, hyperbole is just the worst. Over the 12 years I’ve been “involved” with lacrosse (involved is in quotes since I don’t play or coach – my sole involvement is watching it and writing about it), I’ve heard a lot of claims about the sport and the league. Some are true and some are not, but many are opinions presented as fact. Let’s take a look at some of them and see which ones actually stand up. Bring someone to a lacrosse game once and they’ll come back again and again. Truth: Nope. If that were true, attendance would continually be increasing. NLL attendance goes up and down just like every other sport, depending on the team’s success, the economy, other sports and entertainment offerings in the city, and a bunch of other factors. The Wings and Rock are drawing far less than they used to. 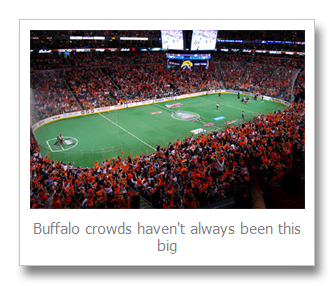 Buffalo had huge crowds, then they dropped off significantly, and now they’re back up. This year, Washington’s first home game had an attendance of 7,023. About 2,000 of those were Native Americans for whom Rochester owner Curt Styres bought tickets. Washington’s second home game was seen by 3,766, a drop of almost 50%. Some people see a lacrosse game for the first time and are immediately hooked, myself included. Many others are not. Lacrosse players play for the love of the game and not for money, unlike greedy NHL/MLB/every-other-sport players. Truth: Tough one. Yes and no. It’s definitely true that lacrosse players make far less money than in the NBA, NHL, MLB, or NFL. While we see NHL players flying first class and staying in 5-star hotels and fighting for $8 million per season instead of a measly $7½ million (and baseball players fighting over double that amount), lacrosse players seem happy to take vacation days from their real jobs to fly coach (or take buses), play a game, and then travel home again before going back to work, all for an average of less than $15,000 per year. The 2005 season was almost cancelled because of labour difficulties, and last-minute negotiations resulted in a deal that saved the season. The 2008 season was cancelled because of a players strike (not a lockout) over money. Again, some last-minute heroics saved the season. That 2008 strike cost the league the Arizona Sting. They are playing the 2013 season under the previous (expired) CBA because they couldn’t negotiate a new one in time for the season to start. Kudos to both the league and the PLPA for agreeing to do this. NLL teams that play games on back-to-back nights do better in the second game. Truth: Nope. Last season, I looked at the back-to-back game stats over the history of the league (up to 2011 since 2012 was in progress at the time) and did the math. The numbers tell us that there is no pattern – playing two games on consecutive nights is no different from playing two games a week apart. I think the confusion here is that it seems like common sense that a team playing on back-to-back nights would be tired on the second night and so one might expect that they lose those games more often. Since teams don’t have a terrible record in those games (on average, their records in those games aren’t any better or worse than their records in any other games), people think “they win more often than they should”, and that ends up translating to “they win more often than they lose”. Lacrosse is the fastest-growing sport in North America. Note that all the stats I could find were American, and were likely talking about field lacrosse. Truth: Mainly false. Again, I’ve done the math and if we look at all of the champions in the 25-year history of the NLL, more often than not they’ve ranked higher in the league on offense than they did on defense. The Les Bartley era in Toronto (1998-2003) was a six-year anomaly. Do you know of other similar statements about lacrosse? Want to know if they’re true? Post a comment and let me know. This entry was posted in Opinion, Stats. Bookmark the permalink.